Aside from just being able to enjoy our books ourselves, we wanted to share them with our classmates–both from Rm. 111 and Rm. 112. We did this in a format called a Favorite Book Museum. In the past I’ve done this with bigger kids and called it a Reading Museum (which had a little bit of a different feel and protocol). This time around, kiddos put together an “exhibit” with their book, a picture of their favorite part and a card with their name (just like exhibits have in a real museum!). Children were given a chance to walk around to view other kiddos’ exhibits, looking for connections as well as for books they might like to read in the future. We started in our own classroom and then traded rooms so we could see everyone’s favorites. After we were sure we were all on the same page, we go busy with our visit! We taught our first graders about “hallway hands” which help us to manage our bodies while we look at our friends’ work. This was another great, positive literary-focused community experience that we will build on throughout the year. We will probably even hold Favorite Book Museums again throughout the year, watching how our tastes change and grow. Have you ever been to a book museum? If so, we’d love to hear about your experience! For many years, I’ve been celebrating reading and helping readers get to know each other better–and therefore build our classroom community–by using a Reading Museum. 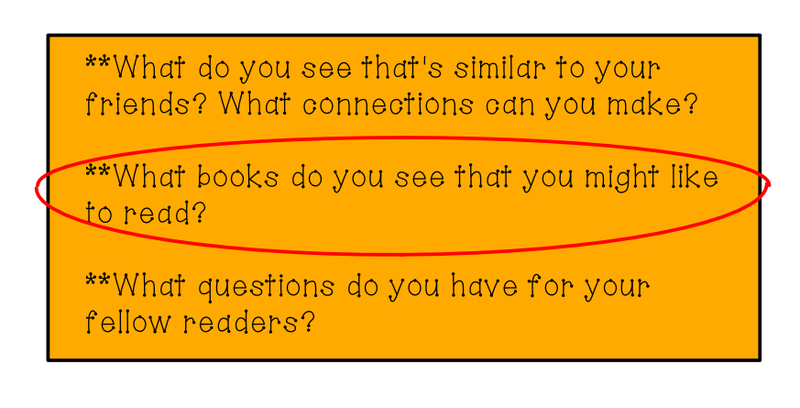 While the difficulty and actual procedures are different depending on what grade I’m teaching (I’ve tried this protocol with 1st, 2nd, 4th and 5th graders), the purpose is the same: help kids see themselves and their classmates as readers and make connections between interests and books! As a “homework” assignment over the weekend kiddos were asked to find their favorite book and bring it to school with them on Monday. After we collected them and took this AMAZING picture, we talked about the purpose of our Reading Museum–as well as what in the world a museum even is (for those that might night have ever visited one). We discussed museum etiquette and then they got busy putting together their “exhibits” (the idea for which came from my friend and teaching partner Ms. Turken who does so many fabulous things in Rm. 203 next door–thanks for sharing your smart thinking friend! ), so we could learn from each other. Kiddos were given a “placemat” and then added their book, their name, and some sort of response to their book: a picture of their favorite character, their favorite part, the reason why they liked it, a picture of the cover, etc. Still, it was a pretty successful time, as books were shared, connections were made and BOOKS WERE READ!! And since I know you can’t see what we actually shared in those teeny pictures, here are all of our exhibits. Enjoy the slideshow! I hope that like writing, it’s no secret that I love reading and books. And getting great books in the hands (and ears!) of kids so that they can have the feeling of losing themselves in a good book. One way we do that in 2nd grade (ok, in all my classrooms no matter what grade they are!) is read A LOT, and talk A LOT about books. This year, since our kiddos are older and wiser, we also added in a Reading Museum, like I’ve written about with bigger kids. I changed the criteria for choosing books a little from when I taught 4th and 5th grade, but really the goal was the same: bring your favorite books to help us learn something about you as a reader. When Friday finally came, we got ready by setting up our “exhibits” and discussing the etiquette for visiting museums. They were reading new books and finding new favorites, and you know what? That’s amazing! The goal of the museum (and in general) is to get kids excited about books and reading and see that it’s for them. When we shared at the end of our museum time, I was reassured that they actually were paying attention to whose books they were looking at, too, as they shared where they’d seen some of their new favorites. YAY! I should have expected that they’d go about it in a little bit different way, and but I shouldn’t have been surprised that they still accomplished the goal I had set out. These kids are super amazing, after all. So glad we did this! All during the first week of school, we spent our time in activities to get to know each other better. During our second week, we continued, but with the focus of getting to know each other better as learners. 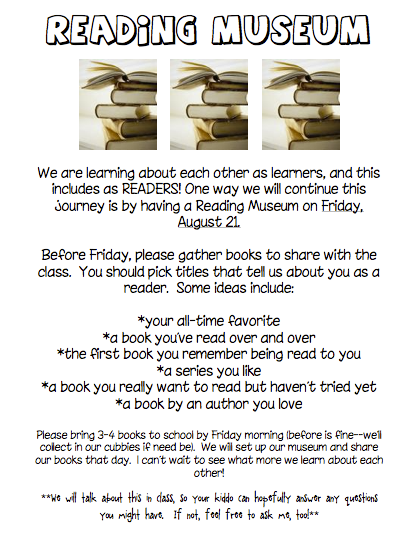 So on Friday during Reader’s Workshop, we held a Reading Museum. The idea was simple, really. Each reader in our room–including me!–set up an “exhibit” that told something about themselves as readers. Then we went around to each exhibit (after having a quick conversation about expectations–you have to act a certain way in a museum, after all) to see what each person laid out. We made connections to other readers’ books and asked questions we had, too. Once we were finished, we debriefed on what we had learned during this activity and how it would help us in the future. What a fun way to spend a Friday afternoon!